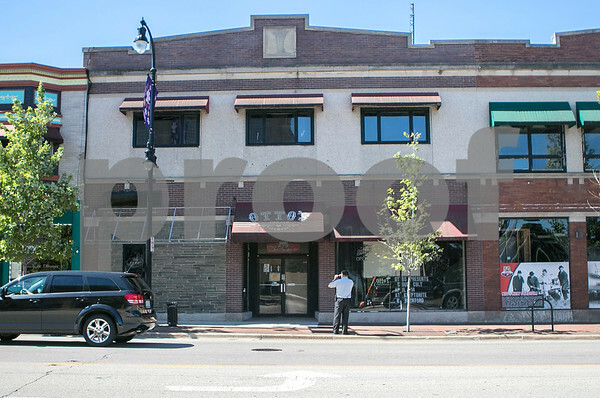 Angel Reyes, with the DeKalb Police Department, takes pictures of the front of the shuttered Otto's building along Lincoln Highway in downtown DeKalb during the investigation after serving a search warrant to allow the city to enter the building on Friday, July 31, 2015. On Friday, the city of DeKalb brought in police, fire, construction consultants, building inspectors, and structural engineers to do a total assessment of the building, which has been closed since Jan. of 2014 due to flooding from a burst pipe. After more than a year of vacancy, the deteriorating building has been causing flooding to the Mediterraneo Grill next door.